While Shutdowns and Meltdowns are a month away from being one year old, they still feel like relatively new statistics to me. 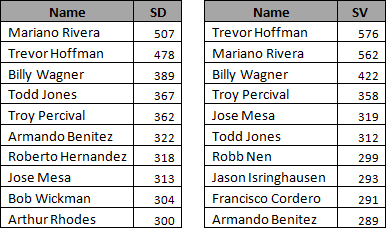 They’ve only recently been added to player pages, and although there have been used in a handful of articles on FanGraphs written over the past year, they still aren’t widely used yet. This seems like a crying shame to me, as Shutdowns and Meltdowns are…well, awesome. For the longest time, saberists would denigrate the Save, commenting about how its rules were convoluted, it didn’t properly value relief pitchers, and it put an undo stress on the ninth inning. And all that is true, but we couldn’t get people to stop and listen as we didn’t have any alternatives to point at. Now, though, those days are past. 1) Shutdowns and Meltdowns are simple and intuitive. While a statistic doesn’t need to be simple and intuitive to be valuable or important – many of our saber stats are rather unintuitive (xFIP, anyone?) – confusing statistics are simply never going to catch on with the general public. VORP was a great concept in the early 2000s, but it had a funny acronym and a confusing methodology, which made it an easy target for mainstream ridicule. Statistics that look familiar and have an easy-to-explain methodology help bridge the gap between mainstream baseball chatter and sabermetric analysis, and they also won’t make you look like a complete tool if you mention them to your friends. While there are numerous caveats and intricacies to the rules surrounding Saves, Shutdowns and Meltdowns can be summed up in a simple, important question: did a relief pitcher help or hinder his team’s chances of winning a game? If they improved their team’s chances of winning, they get a Shutdown. If they instead made their team more likely to lose, they get a Meltdown. Intuitive, no? But how do we determine if a relief pitcher helped or hurt his team? Using Win Probability Added (WPA), it’s very easy to tell exactly how much a specific player contributed to their team on a game-by-game basis. If a player increased his team’s win probability by 6% (0.06 WPA), then they get a Shutdown. If a player made his team 6% more likely to lose (-0.06), they get a Meltdown. These cutoff points put Shutdowns and Meltdowns on a similar scale as Saves and Holds, meaning that 40 shutdowns is roughly as impressive as 40 saves. While the WPA aspect can take a bit to explain to saber newbies, having Shutdowns and Meltdowns on the same scale as Saves makes it much easier for new people to accept and understand. Pretty similar lists, huh? 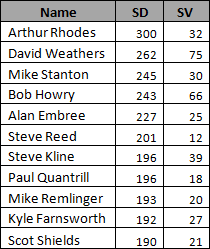 The only big difference is Arthur Rhodes (34 saves over this time period) showing up on the Shutdown list, which goes to show how dominant he was in middle relief. Over this time period (1995-2011), Shutdowns and Saves have a .80 correlation coefficient, while Blown Saves and Meltdowns have a .86 correlation. Both those are very strong correlations, which I think goes to show that while SDs and MDs may be very different from Saves, generally they’re showing similar things. 3) They conceptually break the idea that only the ninth inning is important. Technically any reliever can accumulate Shutdowns. The definition for Shutdowns and Meltdowns doesn’t specify that a pitcher must finish a game: instead, it measures which relievers most helped or hurt their team’s chance of winning. A pitcher could get a shutdown in the 9th inning, 7th inning, 4th inning….whenever. This statistic doesn’t discriminate. Last season, Daniel Bard was fourth in the league in shutdowns, but he only had 3 saves to his name. Bard actually had more shutdowns than the Red Sox’s closer, Jonathan Papelbon (35). While I’m sure Red Sox fans would have been able to tell you that Bard was a very valuable member of their bullpen, now we have a stat that helps show us how valuable. For all these reasons, I think Shutdowns and Meltdowns should get a bit more love. They’re a simpler, better way to discuss relief pitcher performances, and they’re also easy enough to understand that saber newbies should be able to pick up on them easily enough. So the next time you’re looking for a way to talk about an awesome or crappy reliever on your favorite team, don’t forget to take a look in the “Win Probability” tab. These stats are too good to get buried or forgotten. For more on Shutdowns and Meltdowns, see their new FanGraphs Saber Library page. Also, while you’re in the Library, check out our new Contract Details section, which includes information on player options, waivers, and service time. We hoped you liked reading Shutdowns, Meltdowns, and Saves by Steve Slowinski!